Everyone have a relaxing weekend? Anyone watch the oscars? I caught little bit of it last night, however I missed the red carpet which is always one of my favorite parts! Anyone have a best dressed? Now I have to say my brain still seems to be in weekend mode this Monday morning. I am having a hard time switching my brain from relax mode into work mode! I have to say that this past weekend was exactly what my body needed. I had no to do list this weekend, can you believe that. I am the girl that lives by a running to do list. I almost feel lost without one, but this weekend I ditched the to do list and went with the flow. And man oh man did that feel good. Friday I had the Butler Alumni Event in Minneapolis. We cheered on our Butler Bulldogs who unfortunately did not pull off a win. But that is ok I still had a wonderful time meeting new people. It was good to get out and socialize. I was a bit nervous going to this event because I knew absolutly no one! But everyone was welcoming and made me feel comfortable! Saturday I slept in and had a lazy morning in my PJs... Finally! I enjoyed a slow morning of coffee, and chatting. It was nice not to rush through these morning rituals that seem so hurried during the week! A quite night in was the perfect ending to a slow paced day. The relaxing vibe of the weekend carried over to Sunday with a slow pace morning before church followed by a large pancake brunch. Yes I made my favorite pancakes! I would much rather be home munching on leftover pancakes and more then likely still in my PJ's! For this weeks dinner I decided to go back and make some old favorites, because nothing really stood out to my taste buds as I looked through my pin board. I know that is hard to believe when there are still well over 1,000 pins! So what oldie am I bringing back this week? 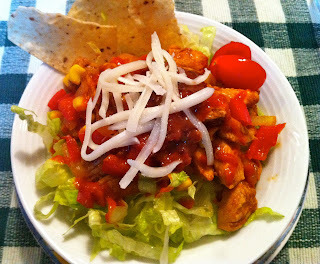 Queue BBQ Chicken Burrito Bowls! Always delicious, and always unique! I feel like I have not made these in forever. We will also be enjoying Renotta's famous spaghetti! But don't worry I still have two new recipes to highlight this week. The first is from the pin board. 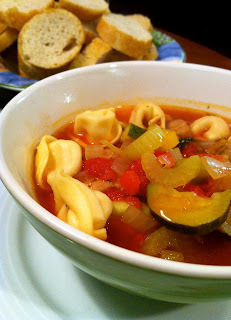 Tortolini Ministrone soup from Taste of Home. I made this soup yesterday night for dinner when I couldn't find sweet potatoes for the second new recipe of the week! The ingredient list remind me of my Grandmothers Ravioli soup which is one of my favorites. I cannot wait to enjoy this soup for lunch today! My sister sent me this recipe on Saturday and I knew I just had to make it! The stew features chickpeas, sweet potatoes and quinoa! I had fully planned on making this for Sunday night dinner but when you cannot find sweet potatoes that presents a bit of a problem! Yum! I cannot wait to try this recipe! My sister knows me so well I just have a feeling I will love this soup! Lets take on last look at the final recipe from last weeks pin challenge! 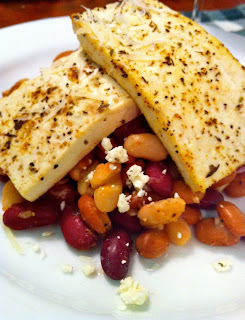 I baked the dish just as the recipe was written but served my portion with pan seared tofu! I think this recipe has a lot of potential, but I want to play around with it a bit! I left out the anchovy paste because I didn't think my family would like the flavor it lended. Did anyone else have a relaxing and lazy weekend? Yeah Gwyneth was pretty classy I must say! i missed all of the oscars...i was supposed to be studying/doing work but i just fell asleep! gwyneths tom ford dress was stunning though! Gwyneth looks so pretty with this dress: love it!!! And you’ve got a gorgeous blog too!!! I had a busy weekend, but it was good. I loved Gwyneth's dress too! I had a slow/low key weekend too! I seriously enjoyed relaxing and taking my time to do things instead of rushing around. I also got things crossed off my to-do lists, so that was good too! gwyneth was by far my fav as well! I don't enjoy watching those awards shows, but I think that Gweneth almost always looks classy! My weekend was super busy-I always say Sunday is my lazy day, but that never happens! i finally tried quionoa and it was alright..i think i like couscous better or maybe it was not flavored well:-( and i wanted Gwenyth's dress....sooo classy! I still haven't seen all the dresses, but your pick is great! The pictures of the food are making me hungry! I didn't watch the Oscars but I did see pics online... I really like Cameron Diaz's dress and I think Emma Stone looked regal!